This was published as a Wall Street Journal Think Tank column on August 29, 2016. Problems in the Affordable Care Act marketplaces are the big story in health care, spurred by Aetna’s pullback in participation. With headlines questioning whether these problems mean the ACA is “failing,” let’s take a step back for perspective. The marketplaces have a special role in health insurance, and they face real challenges, but they are a modest part of the overall insurance system. They are also only one part of the ACA–if an important part–and they are not having trouble in all states. First, there absolutely are problems in the marketplaces. Premiums will rise much more rapidly next year than they did this year. As the Kaiser Family Foundation’s analysis for the Wall Street Journal story published this week shows, in almost a third of counties–31%–marketplace enrollees may have a choice of only one plan next year. This will affect about 19% of enrollees, primarily in rural areas, and is a substantial increase from this year. But the administration is right to point out that the vast majority of enrollees will be insulated from premium increases by government subsidies if they enroll in one of the lowest-cost plans available in their area. Still, some enrollees who receive partial or no subsidies cannot afford coverage. President Barack Obama recognized that this month in his Journal of the American Medical Association article on the law, which called for Congress to increase financial assistance for this group. Second, the marketplaces fulfill a vital role in the health system: replacing the previously broken non-group insurance market where many people could not get coverage if they were sick. But they are far from the only means through which most Americans get their health coverage. About 11 million people are enrolled in the marketplaces. More than 13 times that many, around 150 million, have coverage through employers, and there are 66 million people in Medicaid and 55 million in Medicare. All the debate and many news stories about the marketplaces may have given Americans the mistaken impression that problems in the marketplaces affect them when they will not. For example, many people with employer coverage believe that they are affected by premium increases in the marketplaces when they are not. The marketplaces are an important part of Obamacare. However, more uninsured people have been covered by Medicaid expansions than in the marketplaces, even though 19 states have not expanded Medicaid. Millions of young adults have been covered on their parents’ employer plans. The law’s insurance reforms, including protections for people with pre-existing conditions, apply to people buying their own insurance outside the marketplaces as well (though so do bigger premium increases coming in 2017, and people buying coverage on their own outside the marketplaces cannot get subsidies). A broad range of ACA reforms in Medicare payments to doctors and hospitals are moving ahead and shifting reimbursement incentives in a better direction, regardless of the issues in the marketplaces. Many of these elements of the ACA are working imperfectly and can be strengthened, just like the marketplaces. But recent talk of “Obamacare failing” seems to conflate the marketplaces with the ACA overall. It’s hard to call the entire law, which covered 20 million more people and reformed insurance rules, a failure. 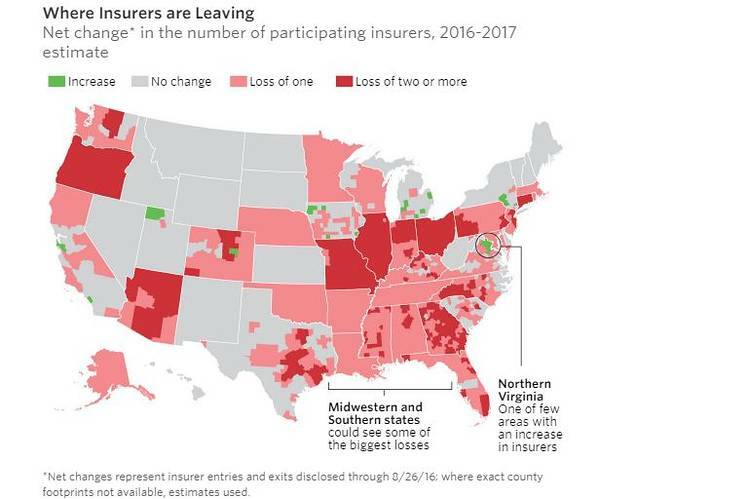 And though the marketplaces face serious challenges, particularly in some states, there are areas where they’re working well and some insurers are earning profits on that segment of their business. The marketplaces do rely on private insurers to work, and those insurers have to be profitable if they’re going to stay in the market. Ultimately marketplace enrollment needs to grow. A Kaiser analysis suggest that enrollment could peak at just over 16 million, which is less than was originally projected by the Congressional Budget Office (21 million) but still robust enough to stabilize growth in premiums. There are also ways to boost enrollment and interest more insurers in participating, if Congress and a new administration choose to work together on such improvements. The issues in the ACA marketplace are real problems that need to be addressed through greater enrollment and policy changes. But if Obamacare had bipartisan support, they would be treated much more like mundane implementation issues to be addressed by Congress than glaring headlines about failure.